Today, I'm excited to share a less sugar version for one of America's favorite cookies, the Chocolate Chip Cookie. As a Truvia Ambassador I've been using their baking blend to create sweet treats that contain less sugar. 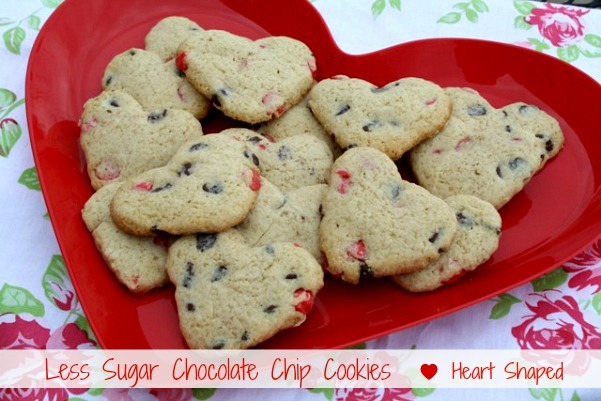 Today's recipe for Heart Shaped Chocolate Chip Cookies have 60% less sugar than the full sugar version without compromising the taste or texture of this classic cookie. Don't you just love when recipes turn out that way? If you're not familiar with Truvia it's a natural sweetener made from the leaves of the stevia plant. Truvia's Baking Blend has the combination of Truvia natural sweetener with sugar and erythritol for sweetness, making it perfect for baking. 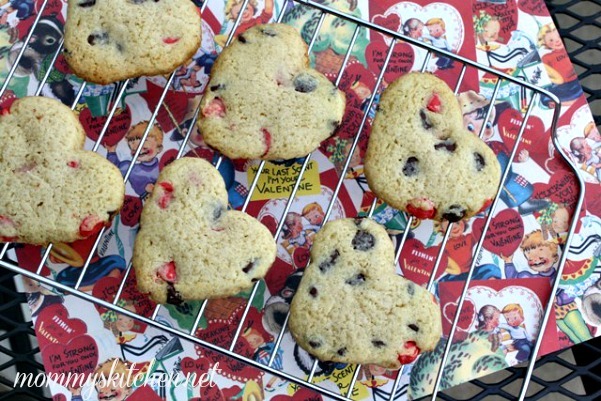 Since Valentines Day is just a few short days away I chose to make Heart Shaped cookies. When I started this recipe I wasn't really sure how these cookies would turn out. I took a chance and hoped that they would taste just like the real deal. The first test was the cookie dough. The texture and taste of the dough was almost exact. I know you're not suppose to eat raw cookie dough, but I can never help myself. I think what I love most about Truvia Baking Blend besides the taste is that there's no complicated measuring. Any recipe that calls for sugar can easily be converted by simply using half as much Truvia baking blend as you would sugar, it's as easy as that. I wanted the cookies to have a little bit of a festive flare, so I used Nestles Dark Chocolate and Red Morsels. 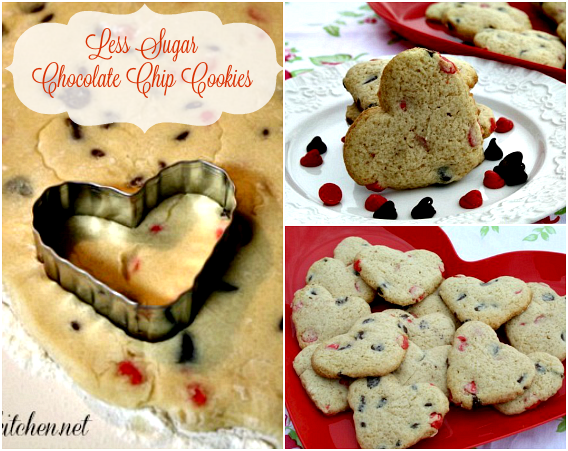 Regular semi-sweet chocolate chips will work just as well. The cookies baked and browned beautifully. When my family started to arrive home they saw the cookies on the counter. I didn't say a thing my little guy grabbed a few cookies and a glass of milk and headed for the table. Beat butter, Truvia Baking Blend, vanilla and molasses in a separate large mixing bowl. Mix in egg. Gradually stir in flour mixture. Stir in chocolate chips. Flour your surface and rolling pin. 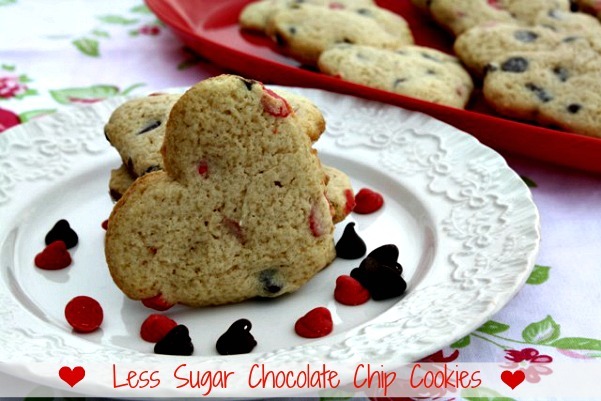 Roll out the cookie dough and cut with a heart shaped cookie cutter. Bake on parchment lined baking sheet for 9 - 11 minutes or until lightly browned. Visit Truvia.com for more information, resources, recipes and baking tips. You can also connect with Truvia on Facebook, Twitter and Pinterest. Hi there, greetings from Malaysia! I'm so glad to have stumbled upon your blog. Your space is too yummy...am loving each and every recipe you posted here. So does this beautiful cookie!!! They are beautiful! I have started using Truvia myself and so appreciate you being a taste tester for me. =) I haven't seen the dark/red chips yet either...what a great idea. Thanks for sharing. Pinning! Marsha the dark and red chocolate chips were found in a middle aisle at Walmart near the Milk and Eggs. In the area where they highlight the holiday baking items.